Plitvice Lakes National Park is undeniably one of the most beautiful places in Croatia, and perhaps even in all of Europe. 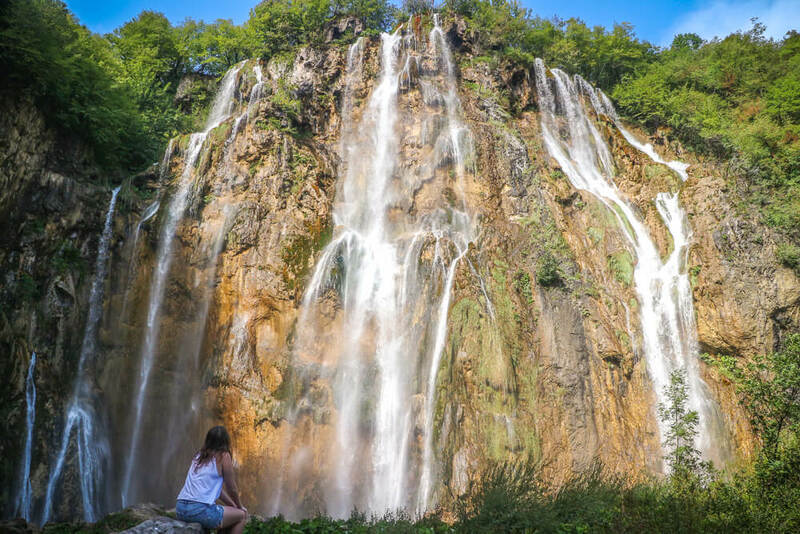 Home to a series of 16 interconnected lakes with unbelievably clear turquoise waters and over 90 mesmerising waterfalls, Plitvice is a place of true natural beauty – so it’s no surprise that it’s been a UNESCO World Heritage Site since 1979. Trails will lead you to fantastic panoramic viewpoints as well as across the lakes and up close to powering waterfalls. The lakes themselves are split into 2 sections – the upper and lower lakes. Both sections are full of enchanting scenery and appealing waters that will do their best to tempt you in, but unfortunately you’ll have to refrain as swimming isn’t allowed anywhere in the national park. If you’re looking to swim up close to a waterfall, then we suggest adding a visit to Krka National Park to your itinerary of Croatia. Plitvice should still be a priority though, with so much to see that you could easily spend a few days exploring if you so wished. 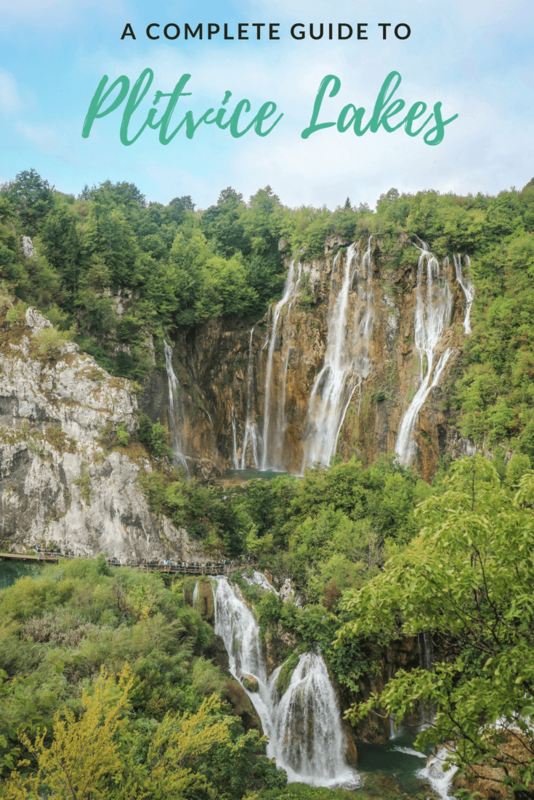 Find out everything you need to know before you visit with this complete travel guide to the Plitvice Lakes National Park. Opening times – The Plitvice Lakes National Park is, weather permitting, open 365 days a year. During the summer months the park is usually open from 7am until 8pm. For up to date information during other months, click here to see the current opening times of the park. Entrances – There are 2 official entrances at Plitvice. Entrance 1 is located at the lower lakes and remains open all year round. Entrance 2 is located at the upper lakes, but this entrance normally closes during the winter months. The park can be explored on foot from both entrances, with buses and boats available to transfer you between the lower and upper lakes. Cost – The entrance fee at Plitvice Lakes National Park depends on the season you visit. During low season entrance tickets cost as little as 60 Kuna. July and August are considered peak season, with ticket prices reaching 250 Kuna. Click here for full pricing information from Plitvice’s official website. Parking cost – Car parking costs 7 Kuna an hour at both entrances to Plitvice. You’ll need to pay for parking just before returning to your car to exit the park. Map – If you want to plan your route in advance, then click here for a detailed map of the Plitvice Lakes National Park. Maps are also on sale at the park entrances. Wildlife – There’s a wild variety of wildlife within the park – from the numerous fish in the lakes to a number of rare bird species. Plitvice is also home to snakes, wolves and even bears – so keep your eyes peeled and your wits about you! Drive – To avoid having to rely on a tour or public transport, we fully recommend renting a car and driving to Plitvice yourself. Doing so means you can arrive at opening time when the park is less busy. It’s impossible to avoid the crowds during peak season, but at least arriving early means you’ll have some time in the park before it becomes overcrowded. We recommend using Google maps or maps.me for directions to the park. If you have mobile data then Google maps is the more reliable choice, but maps.me is great if you don’t have access to the Internet. Alternatively check out the park’s website for their directions on getting there. The length of your journey to Plitvice Lakes will depend on your starting point, but in general expect it to take around 2 and a half hours from Split and 2 hours from Sibenik and Zagreb. Click here to get a car rental quote for your trip! 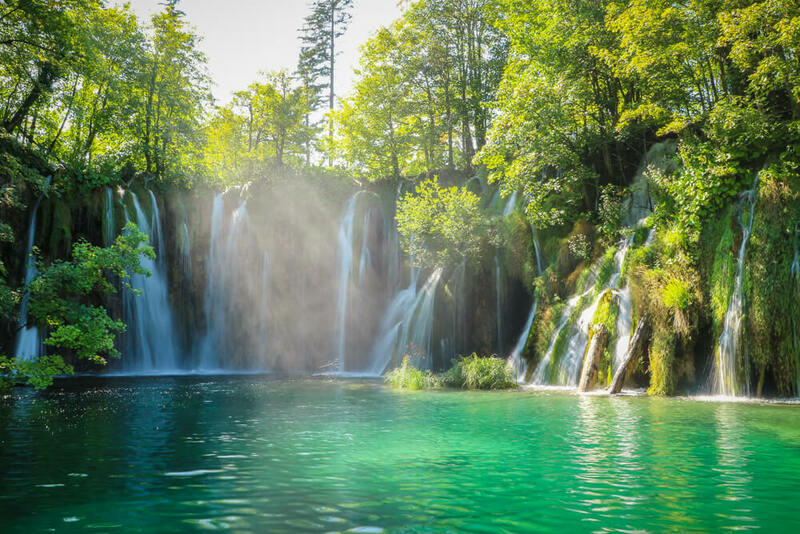 Tour – If you’d prefer not to drive, the easiest option is to take a day tour to Plitvice Lakes National Park. Fortunately, these can be arranged easily online, although due to the popularity they may sell out – so we recommend booking as far in advance as possible! Many tours depart from Split and Trogir to reach the Plitvice Lakes, which means the journey there is over 3 hours – but it is well worth it! The tours are great value and include your entrance fee, a guide and return transport for a one day trip to the park from either Split or Trogir. Click here to find out more and book a tour to Plitvice Lakes National Park before they sell out! Bus – Buses run from a number of Croatian cities to the Plitvice Lakes. For up to date schedule information and to book tickets, we recommend using Bus Croatia’s website. If you are planning on travelling to the park by bus, make sure you know which entrance you want to get off at and inform the driver. As the park can be extremely busy in July and August, the best time to visit Plitvice is in May/June and September/October. Visiting at this time means the park will be less crowded, which will make it a much more enjoyable experience. Although the summer months are the most popular, visiting the Plitvice Lakes in winter can be extremely rewarding. If you’re lucky, you’ll find the park covered in snow with some of the lakes and waterfalls frozen. This spectacular sight is truly unforgettable, although you’ll need some luck to time your trip perfectly. Click here for enchanting pictures of Plitvice during winter. If you do plan to visit in winter, you should know that depending on weather conditions you may not be able to access all of the park. It’s common for the upper lakes to be closed, with no boats running there from the lower lakes – but if the weather conditions are good they may be running. As the upper lakes are often inaccessible, only entrance 1 is open during winter. Due to higher water levels, some trails may also be temporarily closed due to flooding. Finally, the shorter days mean the park has shorter opening hours outside of peak season – so make sure to check their website in advance for up to date information. Plitvice Lakes National Park is 296 square kilometres, making it impossible to see everything in a day. The park’s lakes actually only cover a distance of around 8 kilometres, which is the main area visited in the park. This area of the park is split into 2 sections – the upper lakes and the lower lakes. Consisting of 12 lakes with amazingly clear turquoise waters, the upper lakes make up a larger section of the park. The Matica river is the main source of Lake Proscansko – the first and highest of the upper lakes. Through a series of waterfalls, water flows onwards through the lakes and into Lake Kozjak – the final upper lake. Veliki Prstavac – Undoubtedly one of the most beautiful waterfalls in the park. A number of streams of water crash over a 28 metre drop, sending spray flying over the walkway – so be prepared to get a little wet! 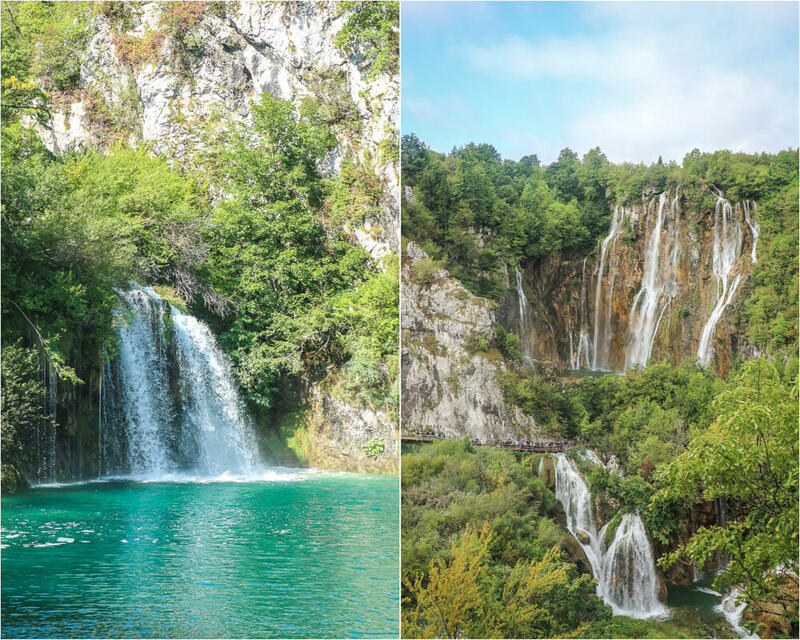 Veliki Prstavac is the top waterfall of the two images shown below. Galovački Buk – One of the most picturesque spots in Plitvice. If you arrive at the right time, rays of sunlight break through the trees surrounding Galovački Buk waterfall. With a drop of 16 metres, it’s not one of the tallest falls in the park but it’s certainly a contender for the prettiest! 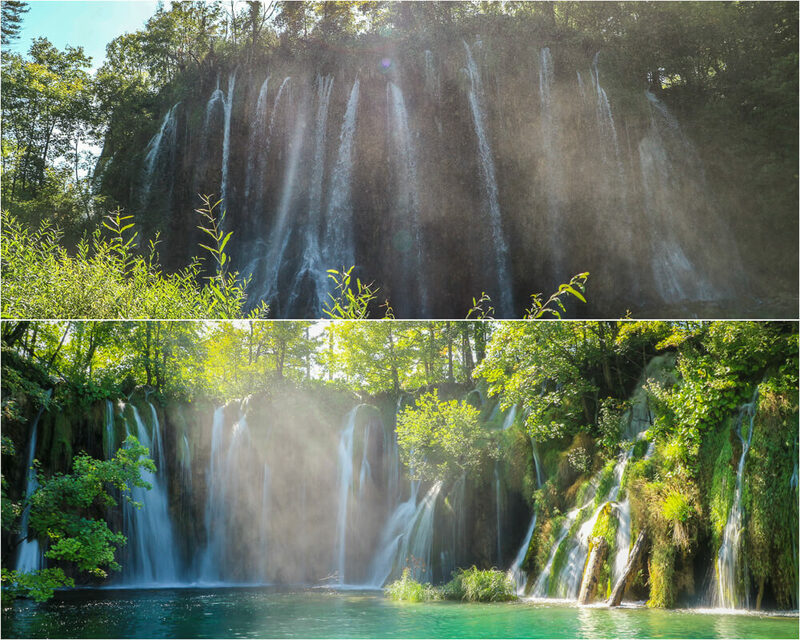 Galovački Buk is the bottom waterfall of the two images shown below. The lower lakes have a different feel to them, and although they account for a smaller section of the park, they are by no means less beautiful! Formed in a canyon of permeable limestone, there are 4 lakes in this section. Lake Milanovac is the first of the lower lakes, and is fed by Lake Kozjak of the upper lakes. The final lake is Novakoviča Brod, from which water flows off into the Korana River. Milanovački Slap – Flowing between Lake Kozjak and Lake Milanovac, this waterfall could technically be considered part of the upper lakes as well. This is the point where water flows from the upper lakes to the lower lakes over a 10-metre drop. Milanovački Slap is shown in the image on the left hand side displayed below. Veliki Slap – The name roughly translates as ‘Great Waterfall’ which is a fitting title for the tallest waterfall in Croatia. Veliki Slap stands at 78 metres tall and can be admired from viewpoints on the path nearby to entrance 1. This path then leads down to the base of the waterfall, allowing you to get close enough to feel its true force. Veliki Slap is the larger waterfall to the back of the image on the right hand side below. Sastavci Slap – At the end of the final lake, Novakoviča Brod, the cascading Sastavci Slap waterfall plunges into the Korana River. Located very close to Veliki Slap, it’s possible to get a wonderful view of both falls together on the path leading down from entrance 1. Sastavci Slap is the lower waterfall in the picture on the right hand side below. 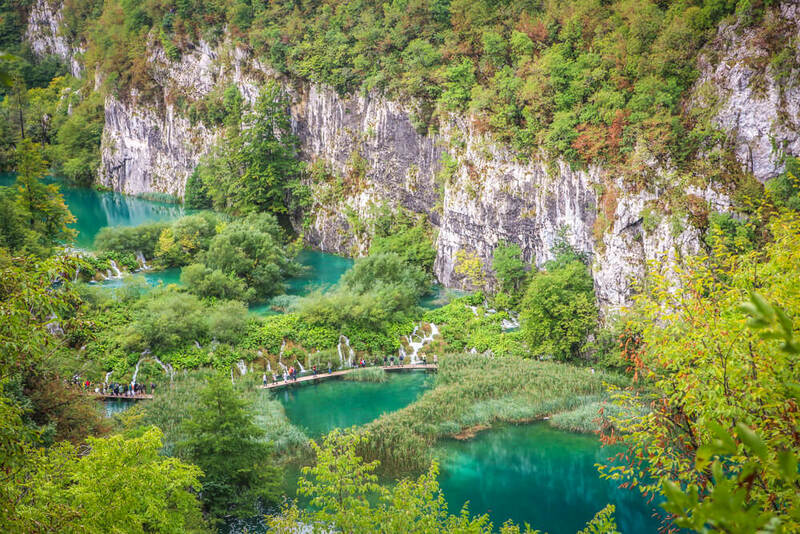 Plitvice Lakes National Park has a number of trails, allowing you to explore the lakes and waterfalls on foot. Wooden walkways meander across the lakes, allowing you to get up close to Plitvice’s waterfalls. Other paths offer panoramic views from above, giving you the chance to appreciate the park’s beauty from afar. The park’s website lists 8 suggested walking routes with trail maps around the Plitvice Lakes. Trails vary in length, giving you the chance to see as much or as little of the park as you’d like. There are also some more challenging hiking trails within the park for those wanting to push themselves! Personally, we opted not to follow one of the suggested routes above on our visit to the Plitvice Lakes. With so much of the park to explore we decided to just follow the routes that seemed less busy in order to escape some of the crowds. No matter which path we took, we were always surrounded by incredibly beautiful nature, so it’s really not necessary to stick to a rigid schedule if you don’t want to. Just make sure you know what parts you definitely want to see and ensure you pass them at some point in the day! You also have the option to make use of buses and electric boats to help you get around the park, as well as renting row boats for 100 Kuna per hour. 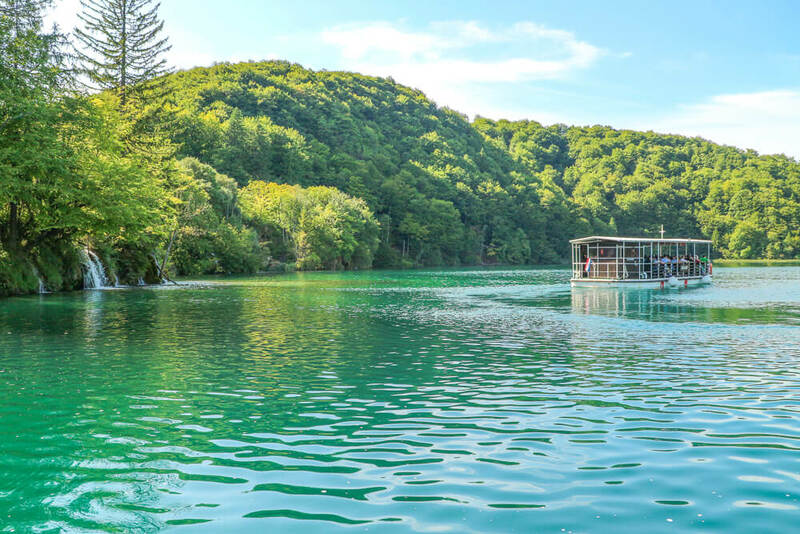 The bus and electric boat rides are included in the price of your ticket and prove particularly useful if you don’t plan on spending a full day at Plitvice. Buses – Although these are sometimes referred to as sightseeing trains, this is slightly misleading. In effect, these are shuttle buses to help you get around the park efficiently if you don’t have time to spend all day walking. There are 3 bus stations within the park. Stations 1 and 2 are effectively stations at their namesake entrances. Station 3 is located near the top of the Upper Lakes section, close to Lake Proscansko. These buses run around every 30 minutes, and an up to date timetable can be found here. P1 – Close to entrance 2. P2 – Across from P1, giving access to the upper lakes. P3 – Close to Milanovački Slap, giving access to the lower lakes. House Marinic – Good quality budget accommodation option can be hard to come by near Plitvice Lakes – and the ones that do exist often book up well in advance. House Marinic is just a 10 minute drive from entrance 1, which is perfect if you’ve opted to rent a car. The property is in a peaceful location with parking available on site. There’s even air con available in some rooms – although there is an extra charge for this. Rooms are available from $39 USD per night. Click here for Agoda’s latest prices at House Marinic. Guest House Slavica – Just a 5 minute drive or 25 minute walk from entrance 2, Guest House Slavica is a brilliant place to stay when visiting Plitvice. The friendly owner will even drive you to and from the park entrance if you request this, which is a lovely touch. We’d still recommend having your own car though, as most restaurants are around a 15 minute drive away. The rooms are comfortable and come equipped with a fan – which should be enough to keep you cool even during hotter summer nights. Rooms are available from $86 USD per night. Click here for Agoda’s latest prices at Guest House Slavica. Apartments Villa Irene – With cosy rooms in a peaceful location, Apartments Villa Irene is a perfect place to stay when visiting Plitvice. Situated amongst some of the area’s fine nature, the property is a 10 minute drive from entrance 1. At an extra cost, the friendly hosts are more than happy to prepare delicious breakfasts and dinners for you during your stay. For those wanting to enjoy more of the great outdoors than just the national park, you can do so from the comfort of the property’s hot tub! Rooms are available from $142 USD per night. Click here for Agoda’s latest prices at Apartments Villa Irene. Hotel Degenija – If you’re visiting in summer and looking for a pool, then Hotel Degenija is the place for you! The hotel has free parking on site and is around a 5 minute drive from entrance 1 of the park. Comfortable rooms are equipped with air-conditioning, although we’d recommend making use of the pool if you’re looking to cool down! It’s definitely one of the best hotels near Plitvice Lakes National Park. Rooms are available from $207 USD per night. Click here for Agoda’s latest prices at Hotel Degenija. Arrive early – This is particularly important during July and August as crowds flock to Plitvice during peak season. Aim to be at the UNESCO World Heritage Site for opening time as tour buses normally don’t arrive until about 9am. It’s still worth doing this just outside of peak season as it remains a relatively popular time to visit. Swim in the Korana River – Although swimming in the waters within the boundary of the Plitvice Lakes National park isn’t allowed, you can swim in the Korana River just outside the park. Click here to find out the exact spot where you’re able to swim without breaking any rules! Alternatively, visit Krka National Park and swim in the famous Skradinski buk waterfall. Bring lunch and plenty of water – As you might expect, food and drink is more expensive in the park. To save some money, bring lunch with you as well as enough water to last you the day. Check the weather in advance and pack extra water if it’s scheduled to be a warm day as you’ll be doing lots of walking! Wear suitable footwear – Wear footwear that is both comfy and appropriate for walking on the sometimes slippery walkways. Pack a jumper and a raincoat – The mornings can be a bit chilly at Plitvice, especially out of peak season, so you may want to bring a jumper. It’s also worth having a raincoat to save your clothes getting drenched from the spray of Plitvice’s waterfalls. Bring suncream in summer – This is self explanatory, but pack suncream to avoid burning during summer days! Watch out for bears – One important thing to know about Plitvice is that bears are found in the park. Although you won’t find bears in the busier parts of the park, if you take one of the hiking trails there’s a small chance you’ll stumble across one. If you plan on taking one of these trails, make sure you know what to do if you do encounter a bear. Never run, as this signals to the bear that you are prey and you won’t be able to outrun one anyway! Try to back away slowly and talk calmly so that the bear can identify that you’re human. If you make plenty of noise while hiking then you’re likely to scare bears off before you get to them, so that’s your best option to ensure safety! For more information, check out this article telling you what to do if you encounter a bear. 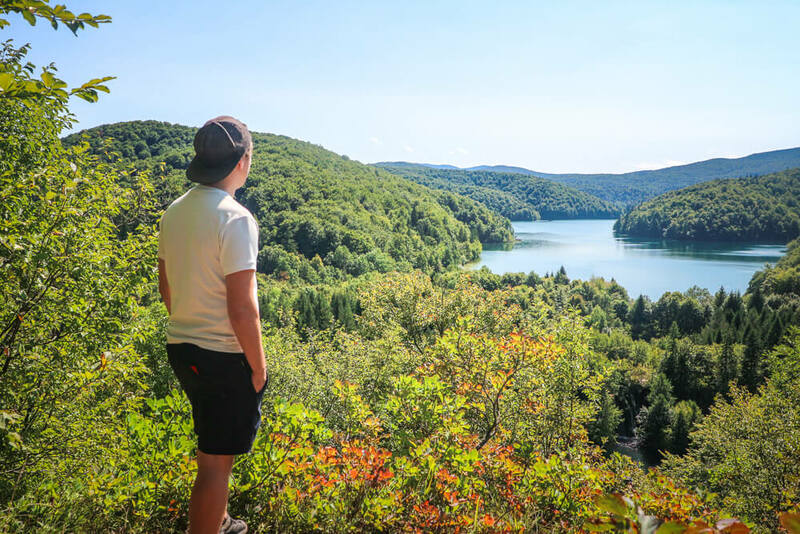 Like this Plitvice Lakes Guide? Pin it!